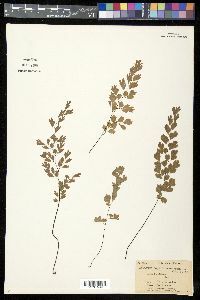 Stems short-creeping; scales golden brown to medium brown, concolored, iridescent, margins entire or occasionally with single broad tooth near base. Leaves lax-arching or pendent, closely spaced, 15--75 cm. Petiole 0.5--1.5 mm diam., glabrous, occasionally glaucous. 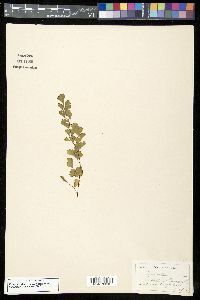 Blade lanceolate, pinnate, 10--45 × 4--15 cm, glabrous, gradually reduced distally; proximal pinnae 3(--4)-pinnate; rachis straight to flexuous, glabrous, not glaucous. Segment stalks 0.5--3.5 mm, dark color extending into segment base. Ultimate segments various, generally cuneate or fan-shaped to irregularly rhombic (plants in American southwest occasionally with segments nearly round), about as long as broad; base broadly to narrowly cuneate; margins shallowly to deeply lobed, incisions 0.5--7 mm, occasionally ± laciniate, sharply denticulate in sterile segments; apex rounded to acute. Indusia transversely oblong or crescent-shaped, 1--3(--7) mm, glabrous . Spores mostly 40--50 µm diam. 2 n = 120. Sporulating spring--summer. Moist calcareous cliffs, banks, and ledges along streams and rivers, walls of lime sinks, canyon walls (in the American southwest), around foundations, on mortar of storm drains; 0--2500 m; B.C. ; Ala., Ariz., Ark., Calif., Colo., Fla., Ga., Ky., La., Miss., Mo., Nev., N.Mex., N.C., Okla., S.C., S.Dak., Tenn., Tex., Utah, Va.; Mexico; West Indies; Central America; South America in Venezuela, Peru; tropical to warm temperate regions in Eurasia and Africa. 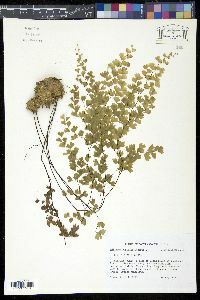 No evident pattern to morphologic variation in the species is discernible, although a number of segregate species and infraspecific taxa have been recognized within North American Adiantum capillus-veneris . In the Eastern Hemisphere, the species is diploid, with 2 n = 60 (I. Manton 1950). Several tetraploid counts have been reported from North America (W. H. Wagner Jr. 1963). Spore-measurement data suggest, however, that the polyploid cytotype may not be widely distributed. 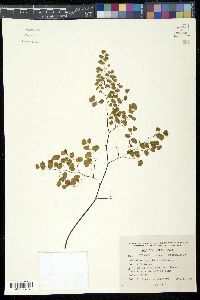 Further investigation is needed to determine whether Adiantum capillus-veneris populations in North America are conspecific with those in Eurasia and Africa. Rhizome short-creeping, 1.5-2.5 mm thick, its slender dark brown scales 1.5-3 mm, scarcely 0.5 mm wide; lvs scattered, lax, mostly 1-4(-5) dm overall; petiole purplish-black, nearly or fully as long as the blade; blade (once or) twice (or in part thrice) pinnate, mostly 2-4 times as long as wide; pinnae alternate, few, mostly 5-12 on each side; ultimate segments petiolulate, subflabellate or rhombic, deeply parted with dentate lobes, lacking a midrib; fertile pinnules slightly smaller than the sterile; 2n=60. Moist calcareous rocks and banks; Va., Ky., Mo., S.D., and Utah, s. to the tropics, and in warmer parts of the Old World; sometimes escaped farther north.